I was a bit surprised, though with hindsight I probably shouldn’t have been, by the level of support — no, admiration — that Epictetus displays for Cynicism in section 22 of book III of the Discourses. I mean, I knew the guy was sympathetic to that other school, and of course Stoicism has had a tight historical connection with Cynicism (e.g., Zeno of Citium studied under a Cynic teacher before inventing Stoicism), but this is quite another thing. “To begin with, you have to set a different example with your behaviour. No more blaming God or man. Suspend desire completely, train aversion only on things under your control. Banish anger, rage, jealousy and pity. Be indifferent to women, fame, boys and tempting foods. He has to realize that he has been sent by God as a messenger for the benefit of others, by bringing them to an awareness of how confused they are about what is good and bad, and how this causes them to look for the good in vain, having no clue as to its true location. How can someone who has nothing – no clothes, no hearth or home, no luxuries, no slaves, no city he can call his own – how is it possible for a person like that to be happy? Well, God has sent among you a person who will prove by example that it can be done. ‘Look at me, I have no home, no city, no property, no slave; I sleep on the ground; I haven’t a wife or children, no officer’s quarters – just earth, and sky, and one lousy cloak. What more do I need? I am cheerful, I am tranquil and I am free. To begin with, at the least to my mind, the Cynic doesn’t come off as either particularly human or particularly likable. Yeah, yeah, I know, likability isn’t the point, but still. The Cynic depicted in these passages is in a sense full of himself (though I’m sure Epictetus would disagree), so much so that he fancies himself a messenger of god to the world, and figures that few if any others are worthy of being his friends. Even Diogenes, who is certainly to be admired in general, comes across as a bit of a jerk in that quote. Perhaps more importantly, Epictetus’ description of the life of the Cynic — with no friends, no family, no property, no enjoyment of the good things in life, etc. — is remarkably close to the sort of things the author tells his students throughout the Discourses, but talking as a Stoic. This suggest that what Christopher Grill called “Epictetus’ ‘tough Stoicism” was really, really close to Cynicism, almost indistinguishable from it, in fact. This is why, even though I enjoy reading Epictetus immensely, both for his wisdom and for his wit, I don’t think he is the best model for a modern Stoic, here agreeing with William Irvine’s attempt to update the philosophy to the 21st century. This isn’t just a matter of revisionism for modern times, however. Stoicism, after all, was supposed from the beginning to be a middle way between Aristotelianism and Cynicism. The different eudaimonic schools had distinctive characteristics, as we have already discussed, and the Aristotelians thought that some of what the Stoics called “indifferents” were actually necessary for a virtuous, moral life. I don’t think they are, which is why I consider myself a Stoic: wealth, health, education, and the like, or their lack thereof, have no bearing on my moral value and my virtues. But the Stoics did admit that these are all “preferred” indifferents, as Seneca explains at length in a number of his letters. It is this move that made Stoic philosophy more human (while still pretty tough) and distinct from Cynicism. In III.22 of the Discourses Epictetus blurs the line with his enthusiasm for the Cynics and his failure to sharply distinguish their doctrine from the Stoic one, and in so doing he does a disservice to Stoicism. This entry was posted in Epictetus on April 27, 2015 by Massimo. Isn’t his description close to Socrates who was a model for both Cynics and Stoics? John, Socrates certainly did influence both Cynicism and Stoicism. But there are differences among those three philosophies nonetheless, despite Epictetus’ blurring – in my view – the distinction between the latter two. 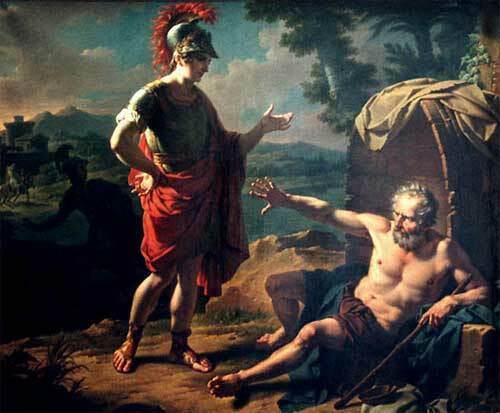 It seems to me that Epictetus is not so much praising Cynicism as he is praising Diogenes. After all, the larger point of the chapter is to discourage his students from embarking on Cynicism without a full understanding of what it entails. The ideal of the Cynic, as exemplified by Diogenes, is useful as proof that it is possible to lead a good life with only virtue, but most of us do not have the requisite strength to intentionally divest ourselves of all “preferred indifferents.” Instead we’re advised to make proper use of these externals as long as we possess them, but not to object when they are taken away from us. So I think Epictetus was just asking that we make an honest assessment of our capacities, and not immodestly launch ourselves in an endeavor we aren’t suited for. It’s this distinction that makes Stoicism a practical and actionnable guide for all, whereas Cynicism can only properly be practiced by those with near superhuman strength. I’ve been enjoying your writings on Stoicism since reading your New York Times Op-Ed. I look forward to your book! Gabriel, very good points indeed. I guess I am, ahem, skeptical of Cynicism not only because it requires almost superhuman strength, but because I’m really not convinced that it would be a good idea, conducive to eudaimonia. I agree with you here Massimo. I think that the religiosity that Epictetus is attached to shines through here, and I think this blinds him to what might be lost in this approach. I see this attempt at extreme non-attachment to worldly engagement as hiding within it’s extreme attachment to it’s own conceptual dogma. I also agree that this type of approach is not conducive to progressive eudaimonia. This is why I ultimately prefer Chaung-zhu as I see him as ultimately trying to avoid attachment to dogma in any form. I think if one is successfully letting go of what cannot be controlled and addressing what can we should increase our likelihood of experiencing and possessing preferred indifferents (like good health). So flaunting disease seems to me no better than flaunting wealth. Any hint on what motivated Epictetus’ appreciation for Cynicism? Chris, well, the suggestion has been made that being a former slave he was in a position to particularly appreciate a minimalist life style, and to implicitly condemn those who didn’t. But of course more generally Stoicism was highly influenced by Cynicism, I just think Epictetus is the most extreme example, compared to even Marcus, not to mention Seneca. On the one hand, Diogenes and Epictetus both come off as pompous “jerks” (as you say). On the other hand, when people like the Peace Pilgrim (http://www.peacepilgrim.com) said something along the same lines, it comes across as so much nicer. Is it just because she looked like a sweet old lady? or what? Scratching head. Fellini, I don’t know much about the Peace Pilgrim, but if she wasn’t going around telling people the sort of things Diogenes told, or saying that she was a messages from the gods to save stupid people, then no, she wouldn’t qualify as a jerk. By the way, I would put Epictetus in that category either, he was moderate by comparison with the Cynics, just not moderate enough for my taste (unlike, say, Seneca).